the refusal to accept or comply with something; the attempt to prevent something by action or argument. 2. the ability not to be affected by something, especially adversely. In the natural world there seems to be a sort of an order. The wind blows and the rain falls. Water freezes when it is cold and melts when it is warmer. The tides come in and they go out once again. We can work with that order or we can resist it. We have a choice. We can fight, struggle, strain and wrestle with something or we can simply, calmly move with the flow, drop our hostility and resentment and simply trust in Someone bigger than ourselves. He is the author of that order. I remember when I was in labor with my daughter understanding this about half way through that experience. I had a difficult time with my first birth, that of my oldest, my son, and that labor ended up in a c-section after 24 hours. Thankfully, we were both OK. At least physically. Although, I wasn’t left with just a c-section scar. I had another, on the inside, in my mind, that continued to haunt me. My c-section was very traumatic and I had painful complications after his birth. I had a difficult recovery and a bout with fairly severe postpartum depression. With my 2nd pregnancy, my oldest daughter’s, I was determined to have her naturally. I really didn’t want to go through that again but as my labor with my daughter ensued I began the same familiar battle with my body. I felt a tremendous amount of fear overtake me. I fought and struggled with every painful contraction. It was soon apparent that I was getting no where and the doctor was once again hinting at the possibility of another c-section. He said he would let me labor throughout the night and evaluate where I was in the morning. If I had not progressed when he came to see me in the morning he would then do another c-section. At some point in the early morning hours, with my husband sound asleep in the corner of the room, I had a realization. I realized that I needed to cooperate with the pain, stop fighting it and let it wash over me. Just let it flow. I needed to experience it even though I was frightened. I needed to just let go. As a first responder, working in emergency rooms for years, this kind of thinking was very contrary to the way my mind had been programmed to operate. I was used to surpressing my emotions, being quiet and strong, and remaining in control but something deep inside of me was telling me to do something entirely different. Strength, I would find out, isn’t always about resisting pain. Sometimes it is working with it, moving with it, through it and finding out where it leads. Pain, properly honed, can give birth to progress and growth. It doesn’t have to swallow one whole as I feared and understood properly it isn’t for naught. It can lead somewhere wonderful. So I stopped fighting and struggling and when the doctor checked me in the morning my baby girl was on her way. I gave birth quickly at that point. My doctor struggled to get ready in time, because whether he was ready or not, she was on her way! It was a peaceful rainy morning when she made her appearance and I was at peace as well. Not only had my daughter been born healthy and whole, something inside me had healed. So, this last weekend we traveled to see my youngest son. He is in a facility where they work with young boys with severe behavioral issues. I have talked about this before but I will refresh your memory just in case you forgot or maybe this is the first time you have read my blog. My son is adopted from the foster care system and he has what is called reactive attachment disorder and oppositional defiant disorder, and that manifests in all sorts of severe, constant, out of this world, often criminal behaviors. He was put in care because he became dangerous to other children and we honestly could no longer function living like that anymore, as a family. So if you didn’t know before, now you know. That, by the way, is the short, extremely sanitary version of what our family has endured. So use your imagination, or maybe don’t. I don’t know. But at least now you have a little context. The Thursday before my husband and myself left to visit our son for the weekend, I started to cry. I cried and I cried and I cried. It was ridiculous. I couldn’t stop! I could hear the ego/flesh (you know, that little idiot that lives in your head who has a real smart mouth, bad attitude and sucky timing) chime in about how silly I was, how ridiculous I was and if I didn’t stop this, now, I might never stop! But, no matter how it badgered and insulted me, I just couldn’t stop. The flood gates were open and out it came and the ego gave up and shut up, thankfully. The anguish that I had been holding in, for months and months, was now pouring out at an alarming rate. Finally I decided to cooperate and just let myself feel it. And I did…..and eventually, thankfully, it did stop. So, we went to see my son two days later. He is living on a rural farm learning to work with animals. He builds and plants things and is focusing on his academics. (Not too much time to focus on schoolwork when you are plotting to take over the world, so he is quite behind, from years of such endeavors.) He looked healthy and he has gotten taller. We took him out to eat, spent time with him walking around town, bought him a watch he was wanting, something to share with the other boys and then took him to the movies. We had a pleasant day. I thought to myself this is a friendly, intelligent, talkative child that happens to have no remorse about his behaviors nor any empathy for anyone, but I have no bad feelings about that. It simply is this way, for now. This is where he needs to be and I do wish him the best in his life whether with us or not. I honestly quite like him and after all the trauma he put our family through that feeling really surprised me. I understand why he can’t live with us or function well in our family. I don’t know if that will ever be possible and it’s OK. I am not resisting or fighting or struggling. I am just trusting and surrendering to my Creator. I was frightened but I decided to cooperate with my pain rather than battle it. I allowed it to wash over me, worked with it and I am working through it. Something good is being born. The Spiritual condition is central, in some way, shape or form, to all of the physical ailments and conditions we find ourselves suffering with. This is my firm belief after many years of trying desperately to address raging fires, mine and others, with little squirt guns full of herbs, supplements and nutrition and prior to that with drugs and surgery. Not that these things do not have merit, at times, but they are not central to true healing. So, I hope you will indulge me in these thoughts, understanding that I cannot look at this journey to health by merely observing the surface and accepting the outward conclusion that things “just happen”, when they don’t. All of my life I have had an unhealthy attachment to many things that I interpreted and believed to be an expression of love. 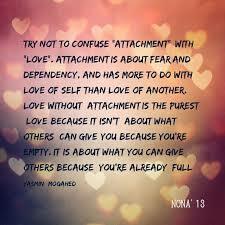 Unfortunately for me, attachment isn’t love. Attachment is just the opposite. The culture I was raised in and still live in perpetuates this misinformation and our egos readily accept it as truth. It makes sense to us. It makes sense to us because we are flawed. Attachment has resulted in untold suffering from the dawn of time. Truly, attachment is the root of all suffering. The story of Abraham and the sacrifice of Issac has been looked at from many different angles over the ages. I dare say I think I have heard most of them. This story always puzzled me. The explanations puzzled me even more than the story. I think that is because I was looking at it from my own limited perspective and from the surface. I think that is because I was also trying to understand it from the limited perspective of others and through the culture I was raised in. Our perspective is very limited, no mater what your culture, race, creed or religion is. It is just a fact. Scientists have come to the conclusion that we only perceive a maximum of 4% of our universe and surroundings. 96% of it we are not able to perceive with our senses. We are truly limited in our understanding. This is just a fact. Paul said in 1 Corinthians 13:12 that for now, “We only see in part.” How correct he was! We only see in part and most the time just what is on the surface and not at all the substance of what something truly is. What is love? Do we understand what it really is? Again, I believe this to be another limited concept that we do not truly understand. Our ego, our flesh and society tell us one version but I am beginning to believe that version to be fairly warped. Isaac was truly everything to Abraham and Sarah. To lose him was unthinkable and beyond painful. My husband and myself, years ago, suffered with infertility. We lost our first baby to miscarriage and another later on. I can attest to the desperation and depth of pain of losing a child and then wanting to hold on like hell when you finally have one. Let me throw this out to you and please try very hard to put everything you understand about love out of your mind for a moment. Look at it as objectively as you possibly can. What if the day Abraham thought he was sacrificing Issac it wasn’t really Isaac he was sacrificing? What if what Abraham was sacrificing was “attachment” and not Isaac. That day “attachment” was slaughtered, not Issac. The Creator made sure of that because that was the point! When you let go of your attachment, what you were holding on like hell to, that love is given back to you, but this time it is pure. This time it really is love. What you had before you only thought to be love, but it wasn’t. You didn’t love it until you released it. God is Spirit and to the carnal man spiritual things are confusing on the surface. I get that. I don’t believe to fully understand that story in the Scriptures, and most others, that it can be received with fleshly eyes. It is deeper than that and not what it seems on the surface at all. On the surface many stories in the scriptures are honestly preposterous and confounding. We can not swim on the surface and wade in shallow waters and ever hope to grasp the depth of understanding our Creator has for us. There is so much more if we dare to go deeper and only He can take us there. Your intellect is completely useless in this endeavor. I dare say that the attachment to these things, in other words, the expectations I placed on them, has resulted in a tremendous amount of pain for me and often others. I believe, now, that even though I thought I “loved” all of the above, and more, that the mere act of attaching my expectations to them was in it’s essence premeditated resentment and resulted in deep disillusionment and disappointment. Pain! My attachment, to everything, save my Creator, was the polar opposite of what love truly is. So, what is love anyway? True love isn’t about “self”. It lets go when it needs to. It trusts. It hopes, but it doesn’t have an agenda, nor does it attach itself to an outcome. It doesn’t cling to what is not true. It doesn’t cling to anything but it’s Maker. It is freedom. It is truth, objective not subjective. It is secure and it is strong. True love is powerful but not coercive. It is kind but not foolish. It is resolute. It is not afraid or co-dependent. And most importantly it is not a “feeling”. I believe after 46 years I am beginning to understand what love is and what it isn’t and what it is is not is attachment. I haven’t been here in a long while. “It” has been inside my head but I couldn’t get “it” out! Something has been blocking “it”. Painting and pouring it out on canvas helped but was definitely not as satisfactory as writing. It happens once in a while when I get tired or I am occupying myself with things that just don’t fit properly in my life. It’s like the “flow” just gets clogged up and I can’t access “it” until I figure out what I am doing that is violating my soul. I don’t know if that will make sense to many but I guess at this point a little update is in order. So here it goes…. So last we spoke I mentioned I was still muddling through grief and healing from the last decade or so of a very stressful situation in my life that pretty much had me living in a state of fight or flight continually. Although still healing, I am doing better now. Just to recap, this has taken quite a toll on me, mentally and physically. Not just me, but my family as well. We were trying to raise an adopted child with a complex disorder known as Reactive Attachment Disorder and a host of other initials I won’t bore you with. If you have never heard of it before that doesn’t surprise me much. People tend to think “adoption, then happily every after!”. Unfortunately, many times, that is not the case. No one prepares you for it and no one likes to deal with the reality and eventuality that this disorder can lead to but it is very real and very painful for all in involved. As a very idealistic person it took a very long time for me to face the truth of our situation. Sometimes a person is just too broken and the damage too great. I wouldn’t have believed that 10 years ago but I know it to be true now. Someday he might heal and be an asset to society but right now he is a danger to many that encounter him. So after much effort, prayer, tears and a gamet of different approaches (you just wouldn’t believe how many) it was decided that he needed more help than we could give him and he is now living in a residential treatment facility out of state where he can no longer hurt the people in our household and in our community. This was probably the hardest decision we have ever made but it has been one of the best for all concerned. That was November 1st, 2015. So, in December the job hunt began in an attempt to help pay for his care. I landed a job at a Chiropractor’s office. Having a background in Alternative Medicine (Neuromuscular Therapist, Doula, Herbalist etc.) I thought it would be a good fit but it turned out it was not. This coming Tuesday will be my last day. I have enjoyed getting to know the doctors and the patients. I feel like I had to be there to learn about myself and others and I did. I had to learn who I am and who I am not. Where I fit and where I do not. And how that is OK. Like my husband said I am just not made to work for others or at least in an administrative/sales position. It is very stifling to my creativity and doesn’t reveal or stimulate the best version of who I am. Even the best “jobs” can be a soul killer if you don’t fit there. I have been self employed most of my adult life and I am a creative person and what might be fine for many is not a fit for me. Working late and not being around to be with my family, particularly my youngest who has ADD and needs a great deal of help with homework was also a big problem. So the plan now is to reinstate my license to do massage therapy, see a small handful of clients from home and homeschool our youngest child who is a sweet, kinesthetic learner that doesn’t fit in public school. Just like me, she needs to be in an environment that brings out the best she can be, rather than power through something that just doesn’t fit. I would also like to work on a writing project I have started about Feminism, the good, the bad and the ugly. Big topic! My husband and myself just returned from Spain a few weeks ago. It was a belated anniversary/roots trip for both of us and something we have needed to do for many, many years but could not because of our situation at home. We both have Sephardic roots in Spain and Portugal. We had a wonderful time in Spain and it gave me a lot of time to think and soul search. It is a wonderful thing to step outside of one’s life and take an objective look at who you are, your life and how things are fitting or sometimes, not fitting. Yeshua (Jesus) said, “Know Thyself…..(see below)”. I really feel like that is a big part of what this journey is about. Recently I took the Meyers and Briggs personality test. I am an INFJ, which explains a lot of my self imposed misery from time to time, but it also explains the depth to which I feel things and the isolation I struggle with at times because I feel so different. It also explains how I can appear to be an extrovert because of my passion for the things I care deeply about but can become drained easily because I am really an introvert fueled by quiet time to recharge my mind. It explains why violating core principles I hold dear is a soul sucking experience for me and I cannot tolerate it for long. It explains why I like my circle small and intimate rather than big and shallow. It explains why I would probably be the most loyal friend you’ll ever have. I care deeply for people close to me. I read people extremely well and sometimes I wish I didn’t although I am fairly long suffering. I don’t wan’t to believe what I see. I see between the lines and I am trying to learn how to *see* without placing a judgement on that but maintain a boundary at the same time. This is an honest struggle and quite a juggling act for me but my awareness is growing in this area. When people hurt, I feel it, and I sometimes have to escape to keep from drowning in their hurt. This is me. I love it and don’t love it all at the same time, but it’s me. I fit some places and I don’t fit other places and that is finally OK with me. At my age I am not looking to be anywhere I don’t belong. I wish that I hadn’t wasted so many years trying to tailor my life to others and societies expectations but the struggle I endured in those situations resulted in learning so better late than never I guess. Know thyself..that is wealth. (3) Jesus (Yeshua) said: If those who lead you say to you: See, the kingdom is in heaven, then the birds of the heaven will go before you; if they say to you: It is in the sea, then the fish will go before you. But the kingdom is within you, and it is outside of you. When you know yourselves, then you will be known, and you will know that you are the sons of the living Father. But if you do not know yourselves, then you are in poverty, and you are poverty.